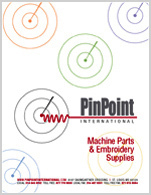 ICTCS 1 & 2 Clamping Systems for use on multi-head or single head embroidery machines. The Interchangeable Tubular Clamping System (ICTCS) was designed with a variety of window sizes for hard to hoop items. The base unit mounts to the machine using tubular arms. The clamp stays on the machine while preparing or removing embroidery items. Changing window sizes is quick and requires no tools. A single lever opens, closes and locks the clamp. The spring loaded clamp automatically adjusts to the fabric thickness, bulky seams and zippers. Use on Carhartt Jackets, leather goods, luggage, backpacks, computer bags, briefcase, towels, rugs, flaps, straps, canvas and bags of all types and other hard to hoop items.